BCRI CEO Andrea Taylor smiles beside a painting in her office. When Andrea Taylor walked into her office at the Birmingham Civil Rights Institute for the first time last week she opened her blinds and was struck by the view. “That will remind me every day why I am here and what I need to do,” she said. Before coming to the Institute to serve as the President and CEO, Taylor served as director of Citizenship and Public Affairs, North America for the Microsoft Corporation. She managed employee engagement and giving and strategic partnerships in the U.S. and Canada with donors, government entities and community-based organizations. She was also instrumental in the creation and implementation of the Elevate America and Elevate America Veterans technology training programs as well as YouthSpark, an initiative providing education, employment and entrepreneurship opportunities for 300 million youth worldwide. And there is not much she hasn’t done. Taylor has visited more than 70 countries for her global work building communities and supporting youth. Up until last year she had been to six continents, having worked professionally on five. In her brief break after Microsoft and before coming to BCRI, she decided to visit her seventh continent so this past winter she took a trip to Antarctica. “I’ve now seen the world,” she said. Her next step is to help change the world, through her work with BCRI. And what a great time to be in the city to do so, she said. The Massachusetts-born woman may be new to the the city and to BCRI, but she is not new to its mission of supporting civil and human rights through education. The self-proclaimed “child of the 60s” grew up in a home where her family had a long history of civic activism and engagement, said Taylor who attended the 1963 March on Washington. Her father, Francis Taylor, was a violinist, jazzman and administrator for the city of West Virginia. Her mother, Della Hardman, was art professor at West Virginia State University and all around Renaissance woman as well as Taylor’s role model. 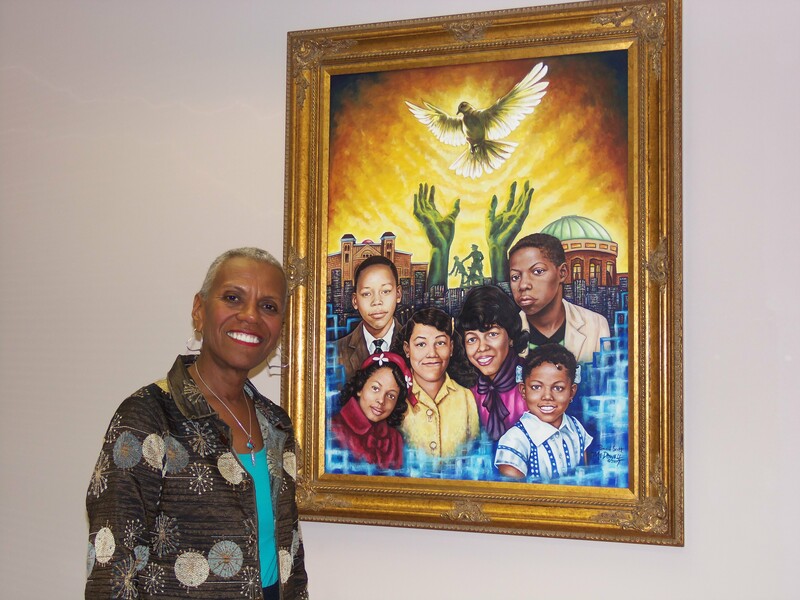 Hardman ran a college art department for almost 30 years and at age 72 got her Ph.D. in art education. Taylor lives by that example. She said “yes” to serving the Birmingham Civil Rights Institute and now her journey has begun. Taylor, who doesn’t own a car, lives downtown and walks to work. She’s an avid runner, having participated in the New York City Marathon in 2009 and this past Saturday served as the ride ambassador for the Third Annual Ride United Birmingham. She’s a three-decade vegetarian and regular swimmer. Taylor is also what she calls a “culture vulture.” She loves all things art and culture and says she can’t wait to become a member of the Birmingham Museum of Art. She is, however, open to Alabama’s favorite pastime.